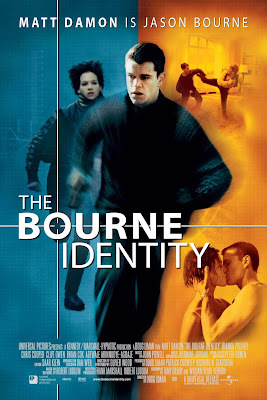 Jason Bourne, the action hero of Robert Ludlum's The Bourne Identity, has a fairly unusual surname, ranked as the 3,461st most common name in the US, according to Name Facts. Of course, it's not nearly as rare as my own last name, Sarokin, with a ranking of 249,774 (take that, Jason). Still, Bourne is a good test name to see how much family history information any given lookup database is likely to provide. I, er, borrowed this image. Hope no one minds. The Social Security Death Index includes 3,075 Bourne's, some born (no pun intended) as early as 1870. There are plenty of Bourne's in the military. The Civil War Soldiers and Sailors System came up with 227 soldiers named Bourne, while WWII Enlistment Records came up with 298. Even the Medieval Soldiers database came up with 17 hits for Bourne, including Adam, Edmund, Henry, Thomas, and a multitude of Johns (but no Jason). Bourne's have a good presence north of the border, it seems, as there are 448 of them in the Canadian Genealogy Centre database. 2,172 Bourne's show up in federal legal cases in LexisNexis, the earliest dating back to 1804...there were too many state cases to easily count. It's always fun searching the half-billion records at WorldConnect. Turns out they win the prize for free databases, with almost 67,000 Bourne's...9 actual Jason Bourne's...to speak of (but only 11 Sarokin's...can you believe it!). I could go on and on, but by now, you might well be asking: What's the point? The point is...there is information on your family name...your family history...your ancestors!...in more places than you might imagine. Searches of large databases are usually fast, easy and, with luck, very revealing. So don't delay. Start searching roots, and find out how many Jason Bourne's, er, family relations, you can find. Okay. So now try Bonn. I don't know how to enter a URL -- why do you ask?